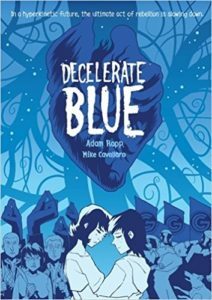 Decelerate Blue is a dystopian tale about a near-future society where everything is sped up: contractions are a must, books are edited down, you must say “Go” at the end of every statement to keep conversation moving quickly, and big corporations are constantly and quickly moving you into purchases. One girl, Angela, tired of the speed of life, finds an outpost of folks determined to decelerate life back to a crawl, and she does everything she can to remain there and help the cause…even in the face of great danger. 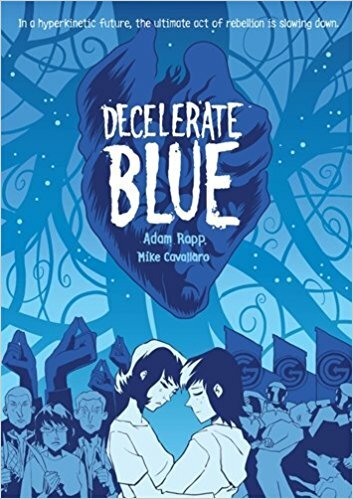 I have to point out that it is ironic that a book about the dangers of minimalizing words is a graphic novel. I have a bit of a problem with the pacing. Almost 200 pages, this book should be at least another 100 pages. World building and the relationships feel rushed, and the ending comes very quickly. I wanted more from this complex story. I wish I had more to say, but I feel like this book isn’t done. What is here is very cool, and you should judge for yourself, especially if you dig old-school Bradbury/Orwell-type stories, but know that you will not be getting the depth of a classic work of dystopian literature. Or, is this book supposed to work as an introduction to those types of classics?? Get kids hooked into a genre? Let me know what you think.